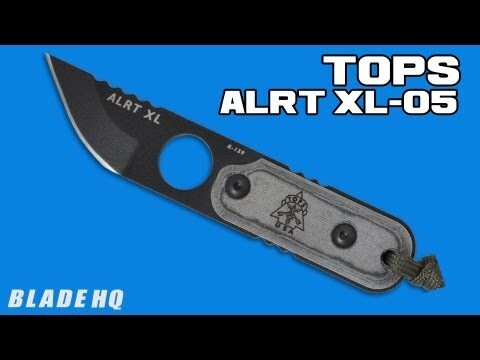 TOPS Knives presents the A.L.R.T (Anywhere Last Resort Tool) XL05 Knife. This fine knife is small and sturdy! Useful in so many situations, as a neck knife, key chain or on your backpack. Knife is 5 3/8" overall with a 2 3/4" 1095 high carbon steel blade with black traction coating. Full tang construction with finger hole for added control. Handle is Black Linen Micarta®. 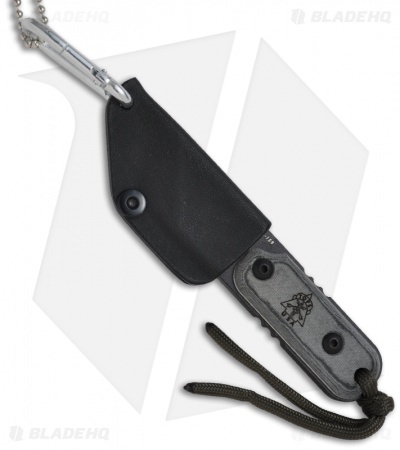 Includes Kydex sheath with lanyard hole, ball chain and carabiner clip. The knife itself is great, solid beefy little blade for backup or light carry. Only disappointment is the pic shows the tops logo on the scale and mine is blank. Not a big deal but pic should show exactly what you're getting. OK, I have to admit I love this thing! On so many levels. 1) As my first TOPS product, I cannot deny their excellent craftsmanship. The BladeHQ video of their shop actually did influence my purchase...So, yeah. Cool on you guys for posting things like that. 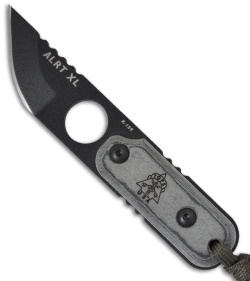 2) It's a crazy, thick, black-coated "tactical" thing; yet the blade edge length is barely over an inch. That's just hilarious. Like the (adorable) growl of a boston terrier. 3) It serves a wonderful (possibly unintended) purpose for me. I'm an artist and I've always loved camping, the outdoors, etc. since before I was in double digits age-wise. I've already used this knife to carve a staff out of a branch I found on my last hike. It's excellent as a carver! I was able to do deep, spiraling grooves; almost like tentacles...Just with this blade. Sure, getting used to its eccentric grip with the finger hole was a bit challenging at first, but about a half hour later, I was loving it. Plus, the stoutness of the build allows for light 'batoning' to cut/chip deep in a small space. All the jimping is also a plus; especially when it's 85+ outside and sweat happens. It was ready out of the box too. I touched it up a bit when I got home, and it easily cuts paper again. As an EDC, it's great. Not too long or heavy. Sure, it is 'heavy'...But it has no more pocket feel than a typical well made 3"-4" folder. My only concern is the sheath. I can see it loosening or wearing out in the future. Not sure what I'll do then. I guess either make something, or contact TOPS.